Since Indian Corn is a natural product, no two ears are the same. This will give your Indian Corn Decorations a unique look. 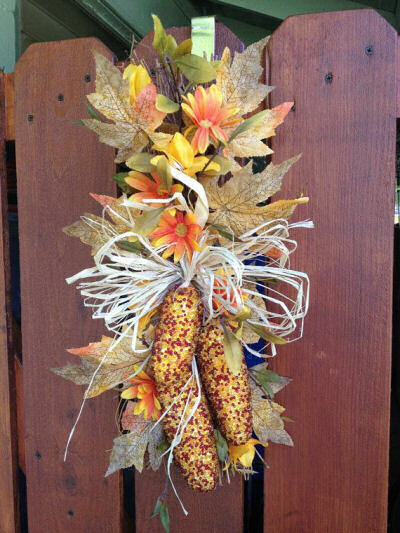 The colors and texture of Indian corn adds an instant rustic look to your fall decor. 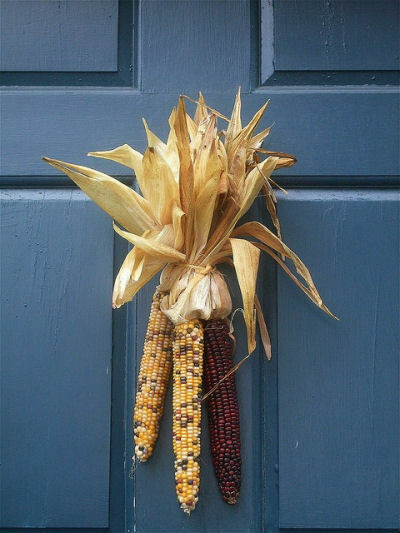 Decorating with Indian Corn for Thanksgiving is an easy and inexpensive way to bring the colors of fall to your rooms and entryway. 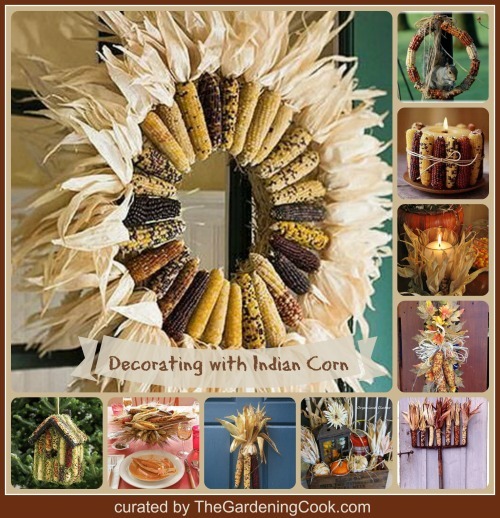 Indian corn is just one natural element that can be used in fall decoration. There are dozens of others that you can use as well. A Step Back in Time – Indian Corn Decorations. 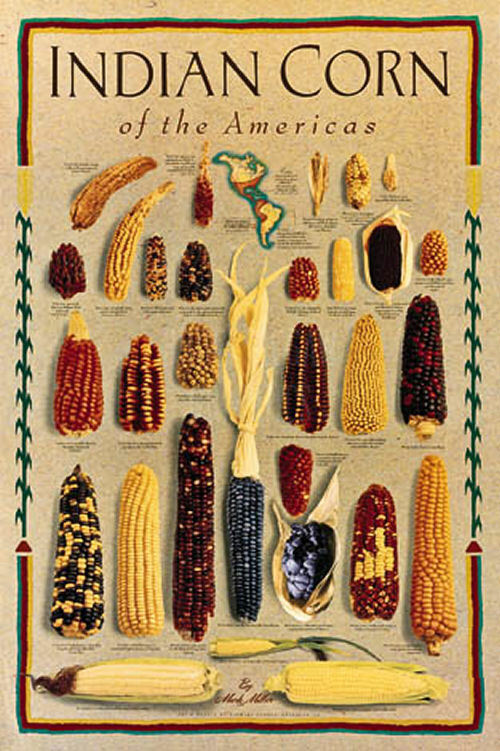 According to folklore, Indian corn was named after the Native Americans. However, the rustic ears are not only found in North America. Indian corn was grown throughout China, India and South America for centuries. 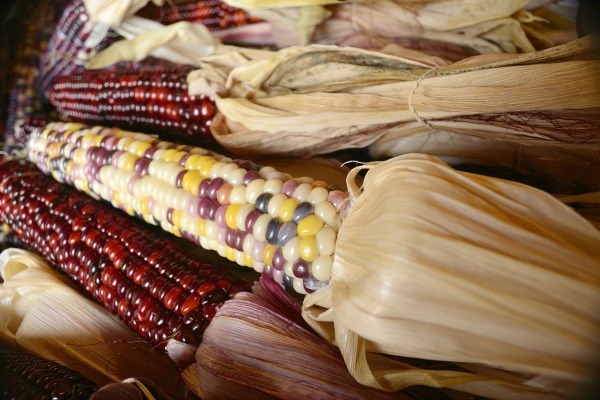 One of the great things about Indian corn is the variety that the ears produce. This poster from ArtPrint Nexus shows just how many colors there are. The designer Is Mark Miller. If you do try to eat this Indian corn, you will find that it is not sweet like the typical ears of corn. It has a starchy texture and taste a bit like hominy. It can be ground to make flour and the whole kernels can be used for popcorn. I especially love the texture of Indian Corn Decorations. They can be used in wreaths, door swags and as accent pieces for table decor. 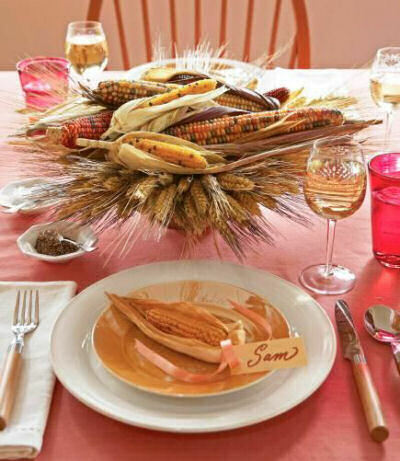 Here are some creative ideas for using Indian corn for home decorating. 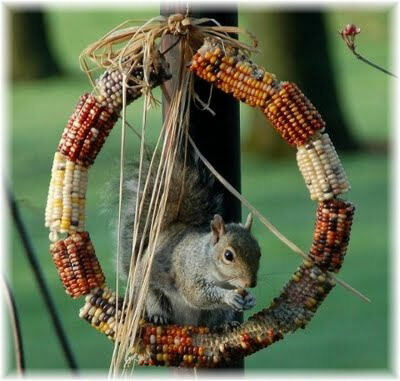 One of the main ways that I have seen Indian corn used for decorations is in a wreath. 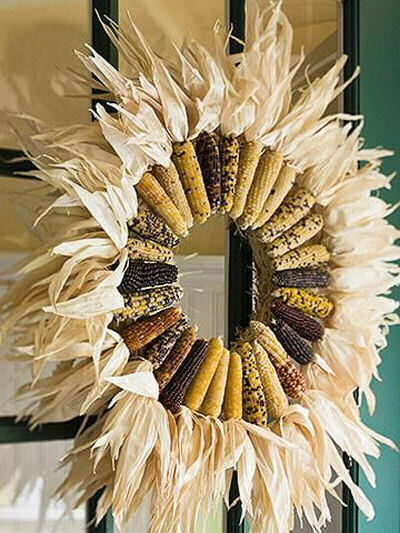 In this creative design, the cobs and ends of the corn alike are used to make a unique wreath with lots of texture and color. Directions from Midwest Living. The squirrels and birds will love this one. To make it, just cut ears of Indian corn in half and poke a hold through the center of each cob piece. Thread a piece of wire or a wire coat hanger through the center so that the ears form a circle. Tie a ribbon of pieces of hay at the top and hang. Idea shared from Pretty Organized Palace. This idea would be so easy to do. 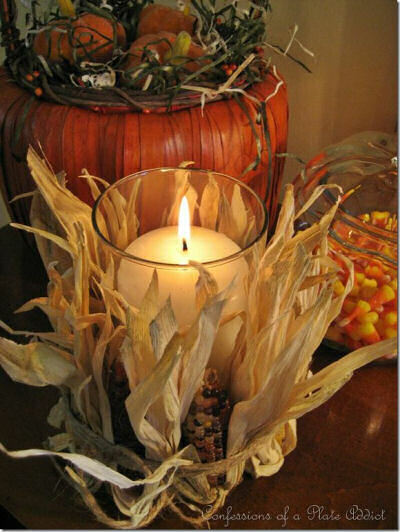 Just alternate light and dark colored ears of Indian corn around a fat cream colored pillar candle and tie the whole thing with some rustic string. Idea shared from BHG. This lovely centerpiece would be perfect for Thanksgiving. It is also easy to do. Just add a piece of floral foam to a bowl and then insert wheat stalks so they fan out and then top with ears of Indian corn. Idea shared from Midwest Living. What a neat idea this is – it houses and feeds the birds all in one go! This is a photo of a product that has sold out from Orvis but doing a DIY project for it would be quite easy if you have a wooden framed bird house. Just cut all your ears of corn in half length wise. Glue them to the sides and top of the wooden bird house and fill in between the ears with some faux greenery. This project is simple but very effective. 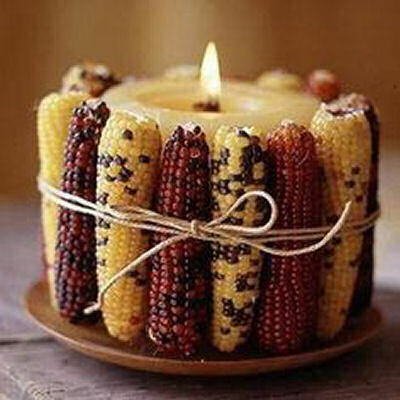 There is something about that glowing candle in the midst of all that Indian corn that just says fall. It’s an easy project too. Just a glass vase, a pillar candle, some string and your Indian corn and you are all set. Be sure to trim the stalks so that there is not a fire hazard. See the tutorial at Confessions of a Plate Addict. 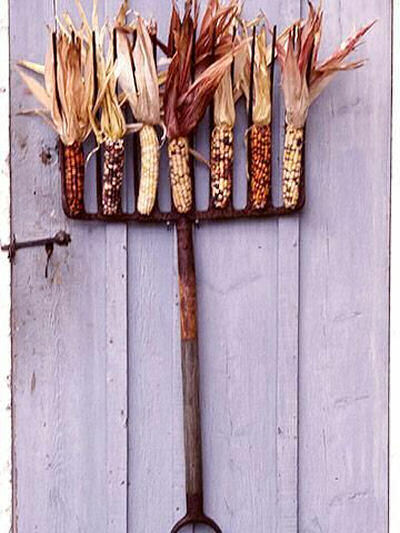 This fast and easy project requires just a bare wall that needs dressing up, some Indian corn ears and an old pitchfork. Just thread the Indian corn on to the pitch fork where the tines are if your fork has just a few tines, or in between them, if it has a lot, and display. Idea shared from Midwest Living. What a lovely way to decorate a rustic wooden fence. Take your ears of Indian corn and add some silk greenery in autumn colors to the top. Tie it all up with some strands of raffia and attach to the top of your fence. Very easy and makes a great looking swag. You could also hang this on a front door for a neat entry effect. This idea is shared from Picking Petals at Etsy but would be very easy to duplicate if you are crafty. 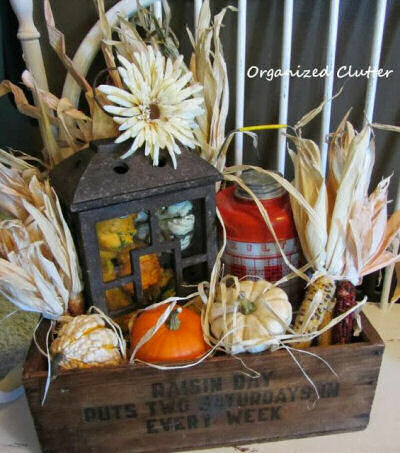 This lovely rustic fall vignette is shared from Organized Clutter. My friend Carlene combined Indian corn, small pumpkins, a Kiltie Plaid Jug and a rustic Lantern for this display. See how she assembled it at Organized Clutter. No round up of Indian Corn Decorations would be complete without a door swag. The shape is perfect for them! Just grab three long ears of Indian corn with stalks attached. Fold the stalks down and then wrap a piece or raffia around the center of the stalks and hang on a nail on your door. The cobalt blue of this door is a perfect back drop for this display. Image shared from Flickr. 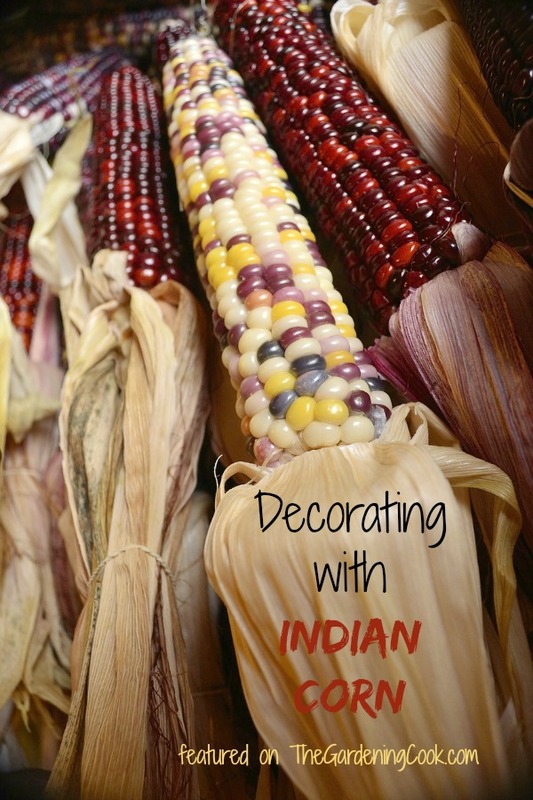 Have you tried decorating with Indian Corn? How did you use it? Thank you so much for featuring my Indian Corn Swag on your blog! 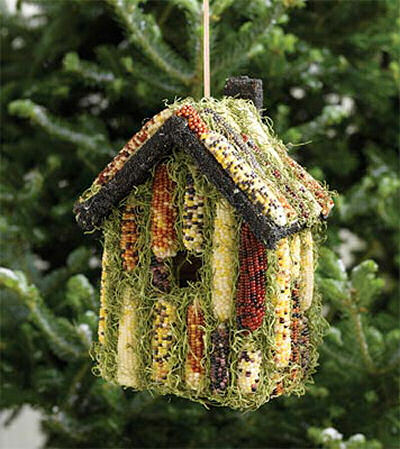 🙂 What lovely ideas for decorating with Indian Corn for this time of year. Fall is my favorite! My pleasure Shasta. I love the swag. I changed my door this year to one with an oval glass panels, so I am on the hunt for swag decor! Me too. It’s so festive and crafty! I’m seen the Indian corn in the stores, but have never bought any. I love these different ideas for decorating with it. Great collection! Thanks LInda. I think I might make a swag for my door this year. Just curious if the corn will cut easily lengthwise for the bird feeder? What did u use to cut it?